The Flipped Classroom is NOT Just for Math and Science! “But that only really works if you are teaching science or math, right?” Wrong. One of the misunderstandings I frequently come across when advocating for the use flipped classroom techniques is the idea that ‘reverse instruction’ is really only suited for math and science and similar subjects where there are a lot of ‘problems to solve’ as a part of the natural learning process. The idea of enabling students to learn about a new topic with content that they can consume at their own pace, and then using the gained class time to review and apply learning, can lend itself to just about any academic subject area. When I first learned about the Flip Classroom, my sons were both studying Spanish. While visiting the classroom one night and listening to the teacher explain her approach, it hit me like a “coulda had a V8” moment, with a figurative thud to my forehead – Foreign Language classes could sooo benefit from the flip! Think about it – one of the biggest challenges and shortcomings of the Foreign Language classroom is the lack of time to actually speak the language conversationally. If you push more of the rote material – the vocabulary drills and tenses, genders, etc., out of the class in the form of content that can be accessed and reviewed any time, you’ve freed up class time for much needed conversational use of the language! In this article, Bergmann and Sams look at various academic subject areas using the flip, and Foreign Language is the first one they discuss, including a real world example of … you guessed it … a Spanish class. Job Bergmann – ‘Flipped Learning’ and Phys Ed! Chapter 10 of Bergmann and Sams’ Flipped Learning: Gateway to Student Engagement is titled, “english was made to flip“. This chapter focuses on English Teacher April Gudenrath and her story as she adopted flipped teaching and learning. Check out this flipped lesson, A Host of Heroes, that April created with ed.ted.com to see flipped English content in action! 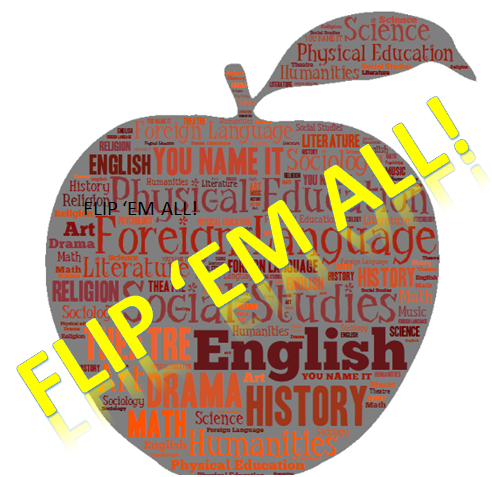 Here’s a whole web site devoted to Flipped History classes: http://www.flipped-history.com/! In addition to a lot of content focused on flipping the History classroom, there’s an article on Flipping Social Studies. Flipped-History teacher Tom Driscoll has been featured in a wide range of flipped learning literature. In this article and accompanying video, Drama teacher Adam Moreno explains how the flip can be a powerful tool in the Drama Class. Use “Outside of Class” time for things like learning directions, readings of scripts, reviewing important terms and vocabulary, and free up in class time for more acting exercises, rehearsals, and performances! Check out professor Richard Newton’s story in Flipping the Higher Ed Humanities Classroom: Teaching Critical Thinking at Cal Poly Pomon. This is really just scratching the surface – the list goes on and on. Pick a subject area and search for it with the term “flipped classroom” in the search and you are likely to come across a published example. Just about any and every academic subject has been flipped. The sky is the limit. Keep on Flipping! Flipped Teaching Techniques + Active Learning = Excellent Educational Possibilities!